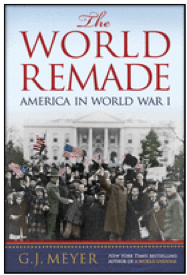 After reading the new book, The World Remade, I realized how little I knew about World War I. Woodrow Wilson is lauded as a man of peace, but he was a self-righteous fool. He believed he was always right about anything. If anyone disagreed with him, that person was not only wrong, but morally wrong and forever scorned. Wilson refused to consult with his cabinet, Congress, anyone but his pal Edward House, who knew how to manipulate him with effusive praise. He was so intent on creating his League of Nations he allowed France and Britain to write a horrendous peace treaty. The British manipulated Wilson (and America) from the beginning: severing underwater cables so only their propaganda got through, collaborating with Wilson’s pal Edward House to write America’s responses to British atrocities, setting a precedence for the future. Britain had been in decline since 1870, while united Germany grew industrially. Britain’s resentment of Germany was a significant reason for going to war. Wreck the upstart rival and reassert their global supremacy. Germany had been the last European nation to mobilize. The others had mobilized on the basis of false reports. When Russia and France mobilized, Germany was motivated, not by the desire of conquest, but fear of being crushed by its neighbors. Innocent little Belgium was not so innocent; rather, it was a junior partner with Britain and France, secretly planning for war with Germany and receiving British aid. Britain decried Germany’s U-boats, but actually had more subs than Germany, preying on Baltic Sea shipping lanes. London’s censors created stories of German “frightfulness” with their U-boats to divert attention from their own transgressions—an illegal blockade of Germany and denying neutrals the right to trade with anyone Britain didn’t want them to. Britain ruled the waves and waived the rules. The U.S. should have maintained strict neutrality, not supplying the Allies and giving them credit, and should not have intervened. The warring nations would have soon exhausted themselves.